Schnorr Signatures, it appears, will first call Bitcoin Cash home before implementation at Bitcoin core. Nonetheless, Bitcoin Cash (BCH) is outperforming other assets and up 24 percent from last week’s close. In recent weeks, Bitcoin Cash has been on a roll. With supportive fundamentals such as Digitec and Galaxus, Avnet and Vordex Suisse all offering support, it’s only a matter of time before prices respond and that will culminate in surges above key liquidation levels. All the same and perhaps a worthy mention is Bitcoin Cash ABC plan of integrating Schnorr signatures before Bitcoin. At the time of press, Bitcoin Cash (BCH) was up 18 percent from last week’s close reflecting how robust Bitcoin Cash bulls have been against bears. While we expect prices to edge higher despite downward pressure from Nov 2018 sell-off, bulls are trading at Feb 24 highs which doubles up as a minor resistance level. 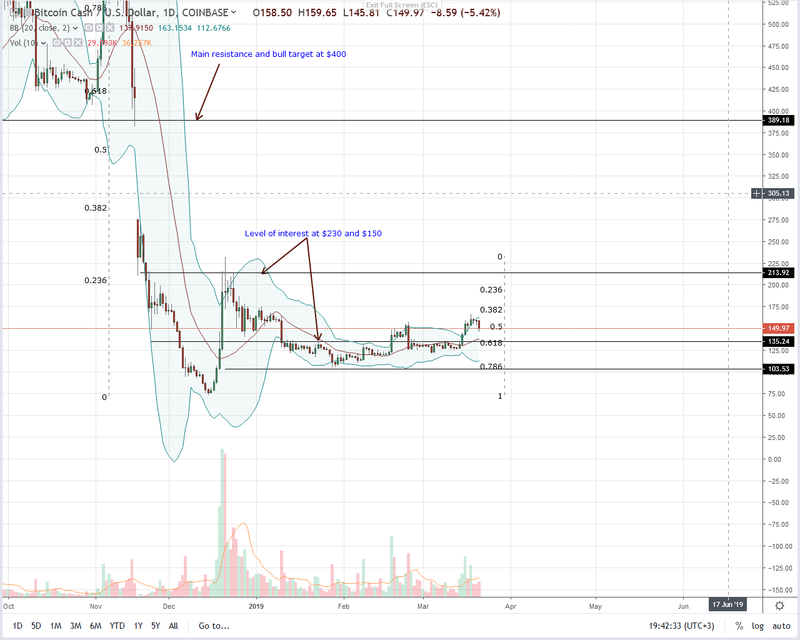 Therefore, for trend continuation, it is preferable that BCH bulls build enough momentum and close above $170 complete with high transaction volumes. Such a move will confirm bulls of Feb 18, fueling participation as conservative traders flow in with targets at $230 or Dec 2018 highs. In a ranging market, BCH prices are re-testing a critical resistance level. Even so, our anchor bar is Feb 18—117k versus 30k. At the moment, bulls have been successful, reversing losses of Feb 24 which is positive. However, a breakout above this three-month consolidation demands participation. As such, gains above $170 must have high volumes above 120k exceeding those of Feb 24.